THE COMPANION: Khaula Bint Al-Azwar RA - The Queen of Islam. 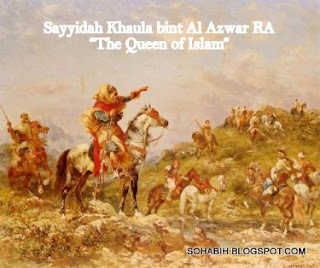 Khaula Bint Al-Azwar RA - The Queen of Islam. Khaula bint al-Azwar RA (Arabic خولة بنت الأزور) was a prominent woman during the life of the Islamic prophet Muhammad. 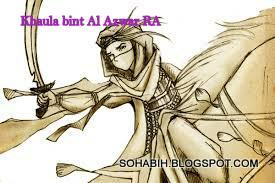 Khaula bint al-Azwar RA was a Muslim Arab warrior, sister of Dirrar ibn Azwar, the legendary Muslim soldier and commander of the Rashidin army during the 7th century Muslim conquest. 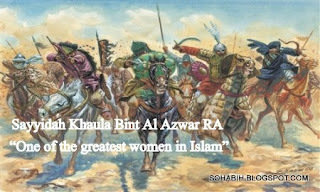 Born sometime in the seventh century, Khaula bint al-Azwar RA was well known for her leadership in battles of the Muslim conquests in parts of what are today Syria, Jordan, and Palestine. She fought side by side with her brother Dirrar in many battles, including a decisive Battle of Yarmuk in 636 against the Byzantine Empire. On the 4th day of the battle she led a group of women against the Byzantine army and was wounded during her fight with a Greek soldier. 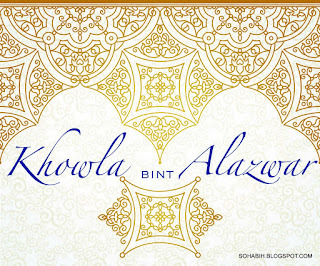 Khaula bint al-Azwar RA became a legend during her life and remains a legend till this day. She set an example to men and women alike that one should fight for what he or she believes in, and never accepts defeat. We don't know much about her youth, except that as a girl young Khaula bint al-Azwar RA learned swordsmanship and literary awesomeness from her brother, a well-known local warrior-poet named Dirrar RA who enjoyed stuff like epic poetry and anything involving stuff that explodes. Born sometime in the seventh century, Khaula bint al-Azwar RA was the daughter of one of the chiefs of Bani Assad tribe. Her family was among the first converts to Islam. 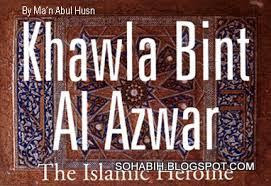 Khaula bint al-Azwar RA father's name was either Malik or Tariq Bin Awz; he was also known as al-Azwar. Khaula bint al-Azwar RA talent first appeared during the Battle of Sanita-al-Uqab in 634, fought during the Siege of Damascus, in which her beloved brother Dirrar RA (or Dirrar) was leading the Muslim forces and was wounded and taken prisoner by the Byzantine army. Khalid ibn Walid RA took his mobile guard to rescue him. Khaula bint al-Azwar RA accompanied the army and rushed on the Byzantine rearguard all alone. In her armor and typical loose dress of Arabian warriors she was not recognized as a woman, until she was asked by Khalid bin Walid RA about her identity. When Dirrar RA joined the armies of Islam in their incessant conquests of the Middle East in the 7th century, his sister joined up to follow the soldiers along and provide medical assistance Florence Nightingale-style. In the battlefront with Khalid bin Walid RA in his sword-pointing towards of Palestine, Syria and Jordan, Khaula bint al-Azwar RA was one of a team responsible for patching together gaping sword wounds, bringing water to dying men, and replacing bandages and cleaning out wounds. Well, one day, during a battle against the Byzantine Empire outside Jerusalem, Khaula bint al-Azwar RA was watching the battle from a ridge when she saw her brother Dirrar RA get knocked from his horse and dragged off by Byzantine troops as a prisoner, and suddenly cleaning horrific injuries didn't hold as much interest for her as inflicting them did. It was at this point that Khaula bint al-Azwar RA did something that set her apart as one of the most seriously toughest women from the middle Ages. Rather than sit back and weep about how her brother. In another battle, Khaula bint al-Azwar RA was captured after falling from her horse. After being taken to a camp with other women prisoners, Khaula bint al-Azwar RA was to be taken to the leader's tent for pleasure. Instead, Khaula bint al-Azwar RA roused the other prisoners, who used the tent poles as weapons and attacked the Byzantine guards. According to Al Waqidi, they managed to kill thirty Byzantine knights with Khaula bint al-Azwar RA taking credit for five, including the Byzantine who that insulted her. Jordan issued a stamp in her honor as part of the "Arab Women in History. “Many Arab cities have schools and institutions carrying the name of Khaula bint al-Azwar RA. Today, an Iraqi all-women military unit is named the Khaula bint al-Azwar RA unit in Khaula's honor. In the United Arab Emirates, the first military college for women, Khaula bint al-Azwar RA Training College, is also named for her. Khaula bint al-Azwar RA was the daughter of one of the chiefs of Bani Asad tribe, and her family embraced Islam in its early days. Her father's name is either Malik or Tariq Bin Aws. Al-Azwar was his nickname. Her brother, Dirrar, was the knight and poet of his tribe, and was well known for his wisdom. His love for his sister and confidence in her capabilities were legendary. In fact, the brother and sister were so attached to each other that she was his companion wherever he went. He trained her on all arts of swordsmanship and she became also a perfect knight. Besides that, Khaula bint al-Azwar RA mastered the noble art of poetry. She was a brunette, tall, slim and of great beauty. 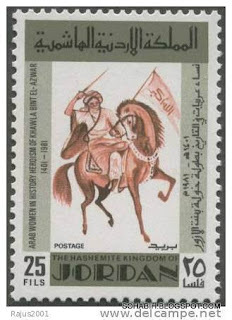 Khaula bint al-Azwar RA name remained greatly unknown, until the battle of Ajnadin, not far from Jerusalem, where Drear lost his spear, fell from his horse, and was taken prisoner. Khaula bint al-Azwar RA donned a male knight's attire, took her arms and rode her mare through the Roman ranks, using her sword skillfully against whoever tried to stop her. The Muslim soldiers, and their leader Khalid bin Walid RA, watched her with great admiration, presuming that she was a man. 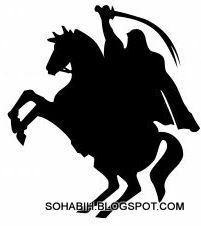 The Arab Historian, Al Waqidi, narrates in his book "The conquering of Al Sham (Greater Syria)"
Illustration Only: The Knight in Islam. "Who is that knight? By Allah!, he has no regard for his safety!" Khalid bin Walid RA answered that he didn't know the man, though he greatly admired his courage. They were fascinated as they watched the knight appear with a number of Roman knights chasing him. Then he would turn around and kill the nearest before resuming his attacks. The Romans eventually lost the battle and fled, leaving many dead and wounded in the battlefield. Khalid bin Walid RA looked for the knight till he found him. By then he was covered in blood. He praised his bravery and asked him to remove his veil. But the knight did not answer, and tried to break away. The soldiers wouldn't let him do that. And everyone asked him to reveal his identity. "My prince, I did not answer because I am shy. You are a great leader, and I am only a woman whose heart is burning." "Who are you?" Khalid bin Walid RA insisted. 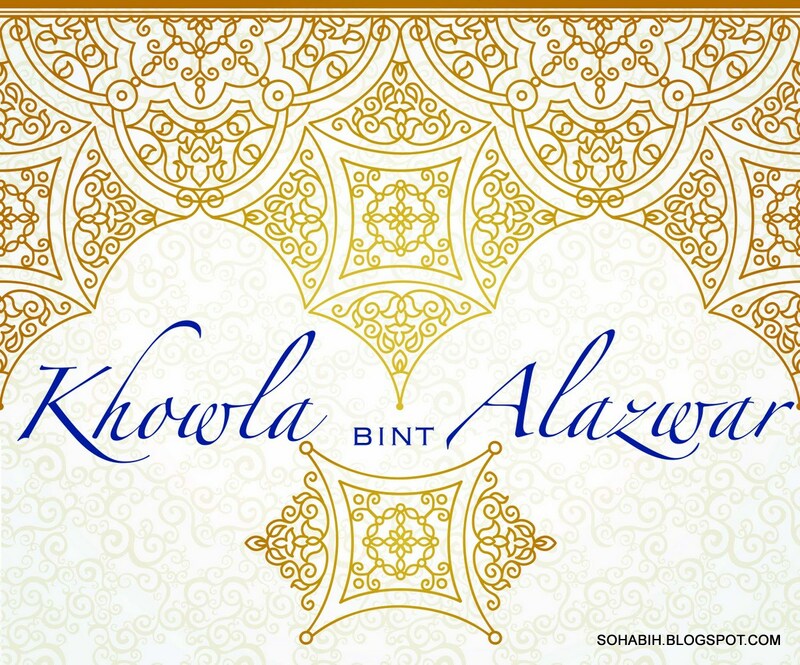 "I am Khaula bint al-Azwar RA. I was with the women accompanying the army, and when I learnt that the enemy captured my brother, which lead me to do what I had to do." Khalid ordered his army to chase the fleeing Roman Army, with Khaula bint al-Azwar RA leading the attack, looking in all directions for her brother, but in vain. By noontime, the victory was decisive. Most of the Roman soldiers were killed. Knowing that the prisoners had to be somewhere, Khalid bin Walid RA sent Khaula bint al-Azwar RA with a number of knights to find them. After a hot chase, they managed to catch up with a Roman detachment that was taking the prisoners to their headquarters. Another fight took place, the Roman guards were all killed and the prisoners saved. In another battle in Ajnadin, Khaula bint al-Azwar RA’s spear broke, and her mare was killed, and Khaula bint al-Azwar RA found herself a prisoner. 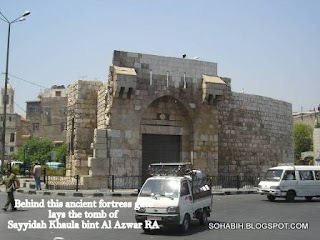 But Khaula bint al-Azwar RA was astonished to find that the Romans attacked the women camp and captured several of them. Their leaders gave the prisoners to his commanders, and order Khaula bint al-Azwar RA to be moved into his tent. Khaula bint al-Azwar RA was furious, and decided that to die is more honorable than living in disgrace. Khaula bint al-Azwar RA stood among the other women, and called them to fight for their freedom and honor or die. The others were enthusiastic to her plan. They took the tents' poles and pegs and attacked the Roman guards, keeping a formation of a tight circle, as she had instructed them. Khaula bint al-Azwar RA led the attack, killed the first guard with her pole, with the other women following her. According to Al Waqidi, they managed to kill 30 Roman knights, while Khaula bint al-Azwar RA was encouraging them with her verses, which in fact caused the enemy's blood to boil. "I wouldn't even accept you to be the shepherd of my camels! How do you expect me to degrade myself and live with you? I swear that I'll be the one to cut off your head for your insolence." In the ensuing battle, Khaula bint al-Azwar RA proved their mettle, keeping their grounds for some time, encouraging each other and driving off the attackers with their long poles. Suddenly, Khalid and the army reached the battlefield. In the ensuing fight, over 3000 Romans were killed. The women who took part in the fighting were proud to say that Khaula bint al-Azwar RA killed five knights, including the leader that insulted her. In another battle, the Muslims were overwhelmed by a much bigger Roman army. Many soldiers fled away, but not for long. Khaula bint al-Azwar RA and the other women met the fleeing soldiers, questioning their claims of bravery and forced them to return to the battle. The men were stunned when they saw Khaula bint al-Azwar RA drawing her sword and leading a counter-attack. They turned their horses and joined the battle, which was eventually won. "Our women were much harsher with us than the Romans. We felt that going back to fight and die was much easier than facing the fury of our women later on". Khaula bint Al-Azwar - Laid to rest behind this fortress wall. Video -the story of Sayyidah Khaula bin Al-Azwar RA. O Allah, I have indeed oppressed my soul excessively and none can forgive sin except You, so forgive me a forgiveness from Yourself and have mercy upon me. Surely, You are The Most-Forgiving, The Most-Merciful. From Yourself: i.e. from Your innermost grace without deserving it and a forgiveness which is befitting to your tremendous generosity.